The Green City Farmer’s Market in Chicago’s Lincoln Park neighborhood is the perfect spot to spend a warm spring or summer morning. They have an amazing selection of produce, bread and cheese from local farmers and bakeries. The Green City Market is a beautiful farmer’s market that happens every Saturday (and Wednesday) from May through October in Chicago’s Lincoln Park. 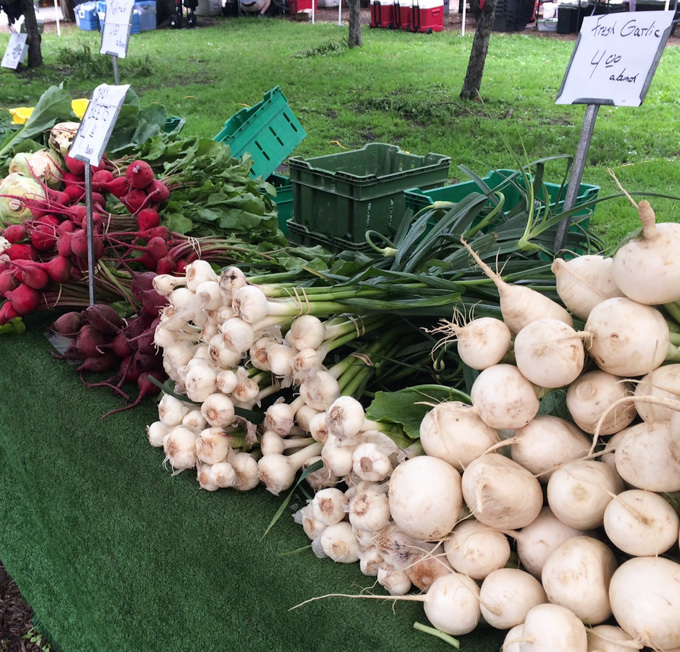 The market features local famers and producers. It’s a great way to spend a Saturday morning! I love to go pick up some fresh fruits and veggies for some of the recipes I’m working on. This particular market also has a good selection of bread, cheeses, meats and eggs. It also has vendors cooking a variety of different things, so you can grab breakfast or lunch while you are enjoying the market. Caprese salad is one of my favorite summer salads, so I grabbed some nice fresh tomatoes and fresh mozzarella from Ludwig Farmstead Creamery and made a quick salad. They real key to a great Caprese salad is using fresh, in-season tomatoes and high-quality mozzarella. Instead of using basil leaves, I use pesto to give it a little more zing. I also prefer to use a balsamic glaze, as it provides a more intense taste and “sticks” to the salad better. You can find balsamic glaze at most grocery stores, or if you have a specialty food store nearby (I get mine from Eataly). I highly recommend investing in a high-quality bottle, as it is a wonderful addition to salads, veggies and many other things! For the photos, I constructed the salad into vertical stacks, which is a nice presentation for a party, however if I’m just serving it for lunch or dinner I typically layer it horizontally on a plate for easier serving and eating. This stacked Caprese salad is topped with avocado and a traditional basil pesto then drizzled with balsamic glaze for the ultimate light summer meal. To assemble the salad, place a tomato slice on a plate, top with a slice of mozzarella. Continue until you have used up half of the tomato slices. Repeat to make two stacks. Top each stack with avocado slices, basil pesto and cracked pepper. Drizzle with the balsamic glaze. Green City Market is located at at the south end of Chicago’s Lincoln Park – approximately 1871 N. Clark Street. For more information visit their website. I always have a bit of trouble when going to the farmer’s market. I tend to have “eyes bigger than my stomach” and overbuy produce! The Caprese stack looks delicious. I just want to cut straight down the middle, smoosh a bite through the pesto and balsamic, and dig in!